Mariz offers different type of front end cylinders for agricultural dump trailers and for other light and medium duty commercial vehicle applications. This type is installed with upper and lower trunnions and it is especially designed for those vehicles with a square body shape, requiring the cylinder to be almost vertical at rest position (maximum inclination: 10°). Optional version with no spherical bearing on top is also available. With top and bottom eye. Both with spherical bearings. 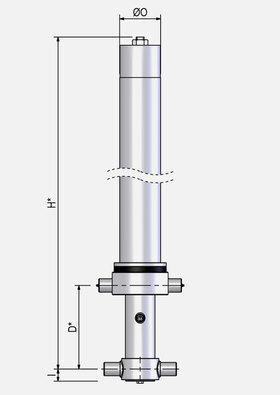 This is an upside down cylinder with upper trunnions and lower eye connection with spherical bearing (MFR-RP version) or - alternatively - lower ball attachment (MFR-SP version). This model is a combined cylinder and oil tank designed system for the UK rigid vehicle tipper industry market. Heavy duty series is also available. Bespoke bracketry (for easy fitting and perfect installation) and other special body accessories are available.